I agree. But, my counter-thesis to the one he presents is this. Since the latter part of the 19th century, the dominant form of capital has been socialised capital, i.e. capital which is not owned by capitalists. It is, for want of a better expression owned by itself, because the company is a legal entity in its own right, or to use Marx's expression, in Capital III, it is capital that is the collective property of the associated producers, the workers and managers, within the firm, be it a joint stock company, or a co-operative. The state, in every society, is ultimately forced to defend and promote the interest of the dominant form of property, because it is its fortunes that determine the fortunes of the state itself. The capitalist state is then led – since the end of the 19th century – to defend and promote the interests of socialised capital, hence the nature of the modern state as a social-democratic state. However, similar to the period of Mercantilism, during which the old landed aristocracy existed in a symbiotic relation with the rising bourgeoisie, in the shape of the merchants and money-lending capitalists, although, today, the dominant form of capital is socialised capital, whose owners are the “associated producers”, control over the socialised capital, at least in respect to the large corporations, resides not with these associated producers, or even with the professional managers – the functioning capitalists, as Marx calls them – but with the old ruling class, whose main form of wealth is now fictitious capital, and through which they exercise control for their own immediate financial interest. Even as bondholders, they exercise this control, as the activities of the “bond vigilantes” demonstrated, and as Greece and other Eurozone countries discovered in 2010. Marx describes socialised capital, in the form of the co-operatives and joint stock companies as the transitional form of property between capitalism and socialism. The social-democratic social relations that arise upon it, are likewise a transitional stage of society. It is the contradiction between the interests of the dominant form of capital, socialised capital, and of fictitious capital that is the major division. Socialised capital, whose personification is the professional manager, interest continues to be the maximisation of profit to enable capital accumulation. Fictitious capital is the primary form of wealth of the old ruling class, whose political power and control over socialised capital is exercised through it. But, the short-term interest of the owners of this fictitious capital is the maximisation of their revenues from dividends, rents and interest, and the maximisation of capital gains, and minimisation of capital losses. In the 1970's, the contradiction between the interests of these two forms of capital – real socialised capital v fictitious capital – came to a head. The interests of socialised capital were formulated within the proposals for industrial democracy, for increased regulation and planning on a wider basis. Given that the revenues for the owners of fictitious capital also depends upon the ability of socialised capital to produce larger masses of profit, this was also in the longer-term interest of the old ruling class. However, the short-term interest of that ruling class was to maximise its immediate revenues, and not surrender its control over productive-capital, through which it also exercised its political power. So, the interests of real capital was subordinated to the interests of fictitious capital. That also created the framework in which the fourth wave long wave cycle flowed into the fifth wave. The fifth wave began with the interest of the old ruling class being the maintenance of the prices of the financial assets that represented its primary form of wealth. However, the prices of those assets depend upon a) the revenues they produce, and b) interest rates. Economic reality is that the revenues depend upon real capital accumulation, so as to increase the mass of profit, continued inflation of asset prices, whilst profit growth is constrained, by restrained capital accumulation, means that yields must fall, unless increasing amounts of profit are drained as revenue, thereby diminishing accumulation further. Eventually, that process runs out of road, as yields approached zero, and the percentage of profit going to dividends rose from 10% in 1970 to 70% today. "It would be still more absurd to presume that capital would yield interest on the basis of capitalist production without performing any productive function, i.e., without creating surplus-value, of which interest is just a part; that the capitalist mode of production would run its course without capitalist production. If an untowardly large section of capitalists were to convert their capital into money-capital, the result would be a frightful depreciation of money-capital and a frightful fall in the rate of interest; many would at once face the impossibility of living on their interest, and would hence be compelled to reconvert into industrial capitalists." As the demand for money-capital rises, interest rates begin to rise, and that means that asset price bubbles will burst. What 2008 represented was again the contradiction between the interests of socialised capital and of fictitious capital coming into inevitable conflict. Crises are always the means by which such contradictions are resolved. The former must ultimately triumph, because the latter has no real existence without it, and is thereby subordinated to it. But, the resolution of that contradiction can only come through a massive bursting of the asset price bubbles. After 2008, the old ruling class were able to assert their short-term interests, but only by damaging their long-term interest, and the immediate interests of real capital – socialised capital. The resolution of the contradiction has, therefore, been merely postponed, and thereby intensified. Its resolution via a new financial crisis, and the bursting of the even more inflated financial and property bubbles, is imminent. Paul, however, wants to argue that it is “class struggle” that plays a significant role. In fact, what he means by class struggle here is only economistic, trades union struggle, to be a slightly better paid wage slave. 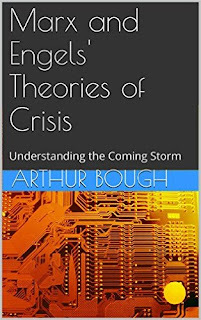 He says that Marx underestimated the possibility of working-class resistance to wage cuts as a factor in reducing profits, but that is because Paul has a false conception of Marx's law of a falling rate of profit, in relation to crises. In fact, as I've shown, rising wages, causing a profits squeeze, is central to Marx’s theory of crises. Moreover, I think that it is Perez who is closer to Marx than Paul, in relation to the situation in the period of stagnation, when she argues resistance to the death of the old system is futile. But, it's also important to note Marx's analysis in Theories of Surplus Value, in relation to this period. Marx notes that the introduction of labour-saving machines throws large numbers of labourers on to the streets. The pressure from this reduces nominal wages. However, the rise in productivity reduces the value of wage goods. It is not at all contradictory to say, therefore, Marx says, that, even as the nominal wages of those in employment fall, raising surplus value, their real wages may actually rise. If, as a result of a rise in productivity, 3 workers can produce what 10 previously produced, so that 7 workers are laid off, the three workers might receive, as wages, what, say, 4 workers previously received. The share of labour in total output will have fallen significantly, so the rate of surplus value rises, but in terms of the real wage of those 3 workers in employment, it will have risen by a third. To put it another way, if, as a result of a rise in productivity, the share of a worker's 12 hour working-day, comprising necessary labour, falls from 10 hours to 3 hours, but they are paid wages that enable them to buy the equivalent of 4 hours value of commodities, their nominal wage has fallen from 10 hours to 4 hours, but their real wage has risen by a third, their nominal wage now buys a third more commodities than it did previously. The main burden, therefore, falls upon the long-term, structurally unemployed. This rise in real wages is often most notable where new industries start to be established. For example, in the 1930's, when the car factories began to be established alongside new industries supplying domestic appliances, in the Midlands and South-East, the workers employed in them enjoyed relatively high living standards, some to the extent of being able to buy houses on newly established suburban estates. It was for that reason that the Jarrow Hunger Marchers directed their route though these areas.